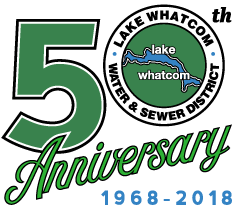 The Lake Whatcom Water and Sewer District first adopted an administrative code for sewer service issues in 1974, by Resolution No. 146 and for water service in 1978, by Resolution No. 242-A. A new administrative code was adopted in 2011, as the District wished to provide members of the public as well as District staff and elected officials with a compilation of District policy in one place organized by subject rather than in chronological order. For reasons of both having a user friendly size and prior practice, not all policies will be found in the administrative code. For example, the District’s personnel policy handbook, commissioner handbook, Comprehensive Water Plan and Comprehensive Sewer Plan are separate stand-alone documents. However these documents are cross-referenced in the administrative code as these additional documents may pertain to the matter being researched. Not all resolutions are contained in the administrative code, since many resolutions are not of broad administrative application. For example, the annual budget of the district, resolutions approving developer extension agreements, awarding public works contracts or approving change orders. However, all District resolutions are maintained at the District’s offices for public inspection and copying.